Modern day Take That are like the drama faces of Melpomene and Thalia. Gary Barlow, the graceful swan of the group, is cementing his position as the country’s premier pop writer by dripping tragedy over soaring, epic ballads. 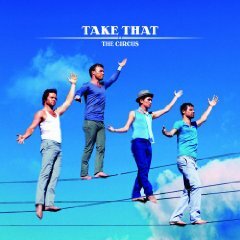 Melancholy lament ‘What Is Love’ has Howard shining on lead vocals, questioning ‘the science of fate’ while title track ‘The Circus’ says it best with ‘I’m the only clown you’ll ever know. I love you was too many words to say’. The brilliant ‘Rule The World’ might be hard to top but opening track ‘The Garden’ and the perky ‘Hold Up The Light’ have that same magical feel. With songs like this, we’re left curious why they went with the relatively lacklustre ‘Greatest Day’ as lead single. Then there’s Mark Owen, representing comedy, still happily bouncing about like ‘Clementine’ was as big a hit as it should have been and creating adorable upbeat pop songs Paul McCartney would be proud to sing. If Morrisons have ruined ‘Shine’ for you, then the cheeky ‘Hello’ will happily take its place in your heart. ‘Julie’ puts Mark in story telling mode and almost feels like a sequel to Babe, but the real highlight is the utterly catchy ‘Up All Night’ complete with a proper oom pah pah band and skip down the street chorus – we can just imagine the video with Take That clad in drummer outfits with big shiny silver buttons. Originally written for BBC Music. I really cannot wait for this, purely to test my theory that this band have actually gotten BETTER with age; their last album was their best IMO… can this one beat it? The new album has exceeded my expectations! It starts with the beautiful ‘The Garden’ that is sung by all Take That members. It is obvious that Mark has had a big influence on the sound of the album. Especially up all night is absolutely brilliant. Jason has a really nice song too! Said it all is very beautiful and the title song is a lovely ballad from Gary. The hidden track is really funny and precious. I could go on for hours, but bottomline: the album is just absolutely wonderful! Well done Take That!